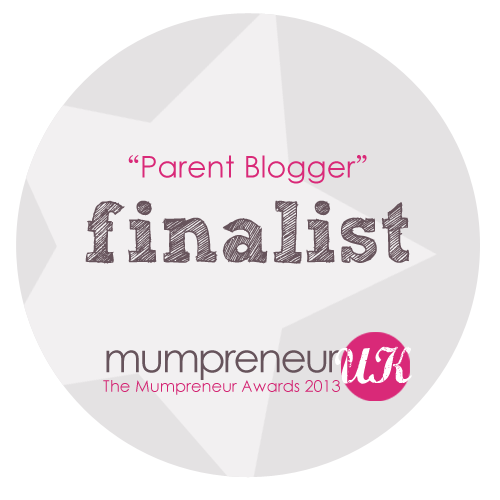 That’s right I’ve just found out that I am a finalist in the Mumpreneur Awards 2013, I’m up for Best Parent Blogger! Over 1500 people were nominated so I’m feeling really rather chuffed to be among the finalists. If you don’t know about Mumpreneur UK, they celebrate parents from around the UK who manage the difficult task of juggling business with family life. The award ceremony is taking place at the Mumpreneur Conference on 28th September in Birmingham. There will be a whole day of speakers, seminars, networking and inspiration so I’m really looking forward to it. There’s even a three course lunch! Pop over to www.mumpreneuruk.com for more information about the conference and awards.